Graig deal has particular appeal not only for its promise of serial production of one of the most well-considered, future- oriented bulker designs, but also for the broader package which the firm brings to the project. Carl Bro, a Danish specialist in naval architecture, marine engineering and project planning. Graig's operating know-how with dry cargo tonnage, aris- ing from both shipmanagement and shipowning activities, helped shape the new breed, while Det Norske Veritas had a direct input on structural and reg- ulatory issues. Most of the bulker new- builds entrusted to China have been pur- chased by shipowning companies other than deal-maker Graig. As one of the first marine groups from outside China to realize the potential of the Chinese yards, it has to date been contracted to supervise nearly 50 newbuilds there, of various types, on behalf of owners worldwide as well as for its own ship- ping interests. Unquestionably, the deci- sion to take the original Diamond 53 program to China, coupled with a prag- matic design approach and Graig's development of a financial package, had brought double-hull construction within the bounds of commercial possibility. China to build series of ships means we can help the yards to develop, and give confidence to our partners that Vietnam can provide them with high quality ton- nage." he added. 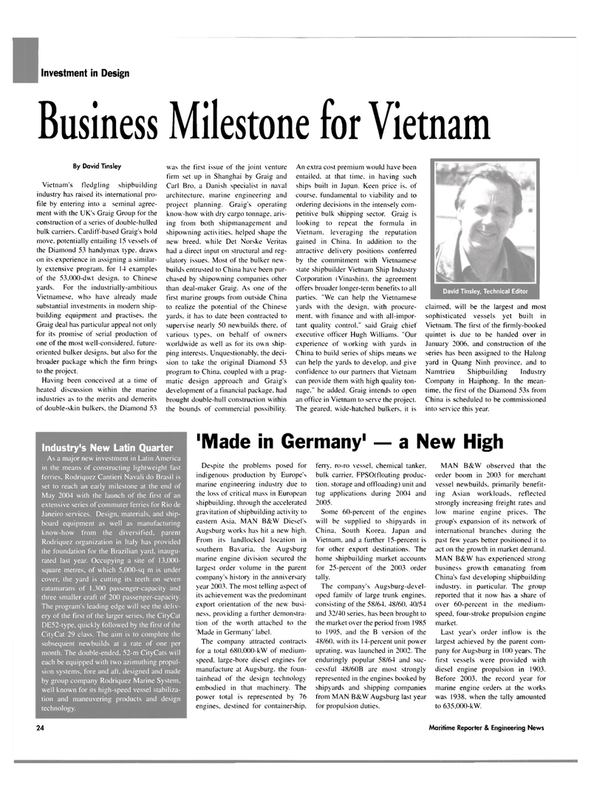 Graig intends to open an office in Vietnam to serve the project. Augsburg works has hit a new high. From its landlocked location in southern Bavaria, the Augsburg marine engine division secured the largest order volume in the parent company's history in the anniversary year 2003. The most telling aspect of its achievement was the predominant export orientation of the new busi- ness. providing a further demonstra- tion of the worth attached to the 'Made in Germany' label. The company attracted contracts for a total 680.000-kW of medium- speed, large-bore diesel engines for manufacture at Augsburg, the foun- tainhead of the design technology embodied in that machinery. The power total is represented by 76 engines, destined for containership. ferry, ro-ro vessel, chemical tanker, bulk carrier. FPSO(floating produc- tion. storage and offloading) unit and tug applications during 2004 and 2005. Vietnam, and a further 15-percent is for other export destinations. The home shipbuilding market accounts for 25-percent of the 2003 order tally. The company's Augsburg-devel- oped famih of large trunk engines, consisting of the 58/64, 48/60. 40/54 and 32/40 series, has been brought to the market over the period from 1985 to 1995, and the B version of the 48/60. w ith its 14-percent unit power uprating, was launched in 2002. The enduringly popular 58/64 and suc- cessful 48/60B are most strongly represented in the engines booked by shipyards and shipping companies from MAN B&W Augsburg last year for propulsion duties. MAN B&W observed that the order boom in 2003 for merchant vessel newbuilds, primarily benefit- ing Asian workloads, reflected strongly increasing freight rates and low marine engine prices. The group's expansion of its network of international branches during the past few years better positioned it to act on the growth in market demand. China's fast developing shipbuilding industry, in particular. The group reported that it now has a share of over 60-percent in the medium- speed, four-stroke propulsion engine market. Last year's order inflow is the largest achieved by the parent com- pany for Augsburg in 100 years. The first vessels were provided with diesel engine propulsion in 1903. Rodriquez organization in Italy has provided the foundation for the Brazilian yard, inaugu- rated last year. Occupying a site of 13,000- square metres, of which 5,000-sq m is under cover, the yard is cutting its teeth on seven catamarans of 1.300 passenger-capacity and three smaller craft of 200 passenger-capacity.